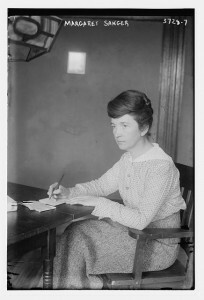 Margaret Sanger with pen and paper, 1914. George Grantham Bain Collection, Library of Congress. Earlier this summer, Jo Guldi asked about best practices for scholarly life, and I’m finally getting around to writing this up. Here’s one I’ve used a lot. Metacognition is thinking about one’s own thought processes. One of the best ways to develop metacognitive skills is by building a habit of reflective journaling. There’s lots of educational research on metacognitive skills. I’ve used some of what I’m describing below in teaching undergraduates, but that’s a topic for a future post. Here, I’m going to focus on reflective journaling for use in self-directed research. My intended audience is grad students & professional scholars, but anyone who needs to do self-directed work can probably use this too. 1. What did you accomplish this week? 2. What big challenges are you facing? 3. What are your plans for the next week? In the context of research advising, these 3 questions provided a useful framework for communication with him. Answering them in advance made our meetings run more smoothly, and it helped me to troubleshoot my own research and writing process. If I were more organized, I think I’d still be answering these questions for myself once a week, because they’re handy for keeping a focus on the progress I’ve made and what I still want to accomplish. Most of the time, though, I find a daily journaling process to be more useful– especially in the time since I moved past the weekly-advisor-meeting level of supervision. Basically, daily journaling is my way of supervising my own work. I learned this form of reflective writing from Michel Fitos, who’s a professional coach and works a lot with scholars and creative people. You can also find Michel on Twitter. This is best combined with a pleasant end-of-day ritual, like a cup of hot cocoa or familiar music, which provides a bit of classical conditioning to reinforce habit formation. This is a way to praise myself for what’s going right. It also helps me notice when I’ve found a new behavior that makes my work better, easier, or more pleasurable. This helps me put words to what’s difficult, and often in the process I find strategies for addressing the challenges. 3. What’s your plan for tomorrow? 4. What have you figured out about the big picture? This is a seemingly vague but useful question. Over time, I’ve found that it helps me turn my pattern-recognition insights into words, which makes them easier to act on. 5. [Optional] What can you do to make tomorrow easier? I answer this question if I had an especially challenging day. It’s a variant of a question one of my favorite yoga teachers uses, usually when she’s put the class into some incredibly taxing pretzel of a position: “What can you do to make this easier?” In yoga, the answer is pretty much always “breathe deeply and focus on how the discomfort feels.” My answers to this question have varied, but they’re always helpful in finding a little more space for solving a thorny problem. Do you have any favorite practices for your own scholarly journaling, or questions you like to use? Please share them below.